A couple of days ago, CCP Larrikin made this map available. It is gorgeous and now serves as my computer wallpaper. However, it also conveys some interesting information at a higher level than we normally see. First, it gives us some idea of the importance of high-sec. Out in sov-null, we like to denigrate it. Often for a good reason – it is, in our eyes, grindingly dull. And in any case, there is a sad lack of dinosaurs, bees, phages and strange squid things. However, it is also home to a significant majority of traffic in the game. 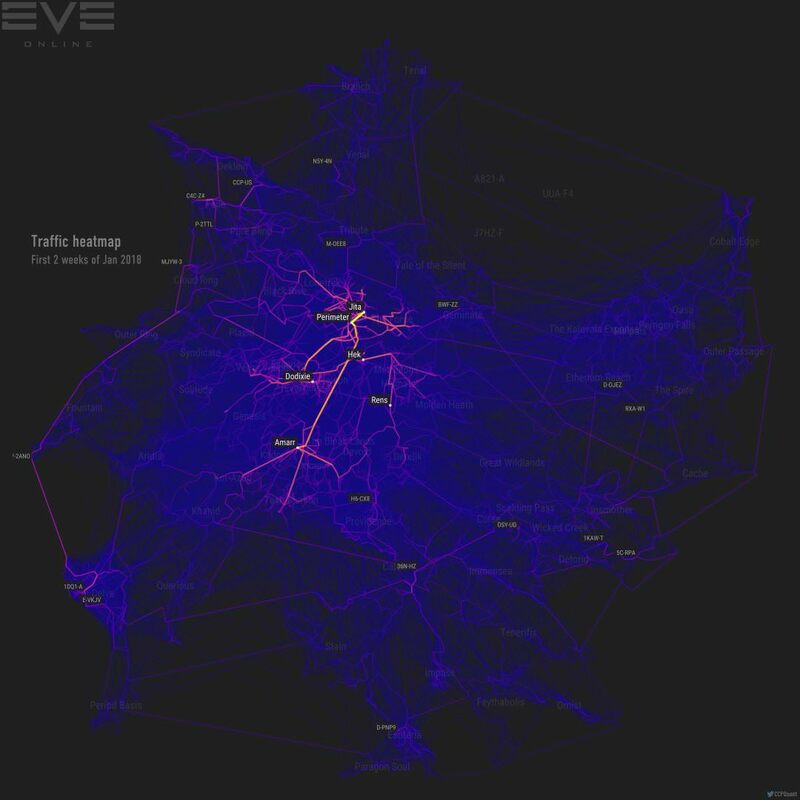 The Amarr-Jita highway is particularly evident part of high-sec’s travel geography, but there is also a profoundly contoured net of transit all around high-sec. This is notably different from much of sov-null, were player activities are concentrated around points of military power. This heat map serves to bring home the ‘lived in’ character of high-sec. Secondly, it tells a little about low-sec. Low-sec is seen to be dead or dying, and this might be true – indeed, east and south low-sec seem barren and less traveled. However, north-western low-sec is alive with activity. Part of this is to do with it containing Black Rise, a noted PvP area. But I believe the other reason is that it links closely with GOTG and Horde space. This segues nicely into what the map tells us about sov-null. We can see, in general terms, that nullsec is quite barren. This is especially pronounced in the south and east. There are small pockets and pipes of activity, but it is not well lived in. But there are two exceptions to this. The first is Delve. We can see that it has developed a smaller form of the sort of links found in high-sec. The spinal highway leading from 1DQ1-A through northern Delve to Fountain resembles the Amarr-Jita highway. Meanwhile, less traveled routes branch through the region and into Querious. The second is a combination of Fade, Pure Blind, and Deklein. Here, we can see an entirely emergent pattern of traffic in the high-sec style. There is a distinctive highway between CCP-US and C4C-Z4 (GOTG and Horde capitals respectively), and a branching system of links. However, what makes this second example so interesting is that it looks to have linked into low-sec. It almost seems like a continuation. Delve is very isolated, with only one faint route leading towards empire space. These northern regions are anything but. This relative isolation vs. connectivity is fascinating from a geostrategic and economic point of view. So, there you have it. 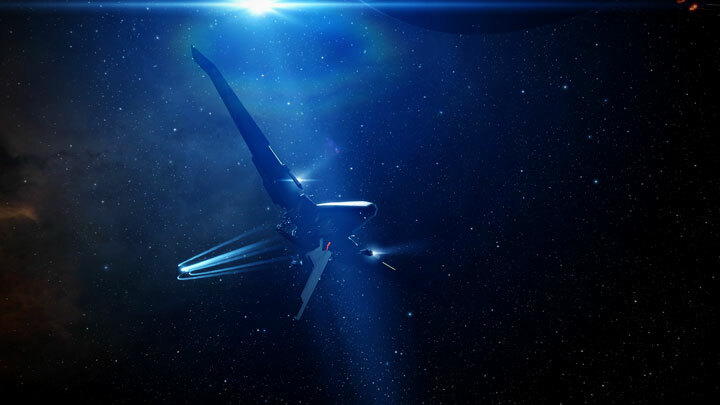 CCP Larrikin undoubtedly created a beautiful picture. But the complexities of New Eden traffic flows within it actually tells us quite a bit about the nature of the game universe. hey there and thank you for your info – I have definitely picked up something new from right here. I did however expertise several technical points using this site, as I experienced to reload the website many times previous to I could get it to load correctly. I had been wondering if your web hosting is OK? Not that I am complaining, but sluggish loading instances times will very frequently affect your placement in google and could damage your high-quality score if advertising and marketing with Adwords. Anyway I’m adding this RSS to my e-mail and could look out for much more of your respective exciting content. Ensure that you update this again very soon.. Very good written information. It will be supportive to everyone who utilizes it, including me. Keep doing what you are doing – looking forward to more posts. Just just how does one make money from blog sites? How does one begin it or go about it? Exists a details means to do it? Just just how does one generate income from blogs in the first place? Where does one get started in this? Do you need to market and use your bank card? Are there any kind of certain type of rules you need to adhere to? Do you need to set the blog up yourself or are there ones that assist you establish it up? How do you obtain marketers on your blog site? Are individuals minimal to the number of blogs online? Just how typically do you earn money?. Thanks for the help!. Leave a Reply to Webdiensten Click here to cancel reply.